It's the last day to enter my Veeve Cosmetics Giveaway!! You know those nights when you want a dinner that takes little to no effort. 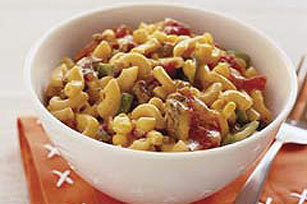 PREPARE Dinner in large saucepan as directed on package, cooking Macaroni for just 8 min. MEANWHILE, brown meat with green pepper in skillet; drain. ADD meat mixture, corn and salsa to prepared Dinner; mix well. Cook until heated through, stirring occasionally. If you really want to get fancy you can top with some shredded cheese and some crumbled tortilla chips! nice easy recipe! good idea! We use to make this all the time. So good! Stopping by from Meet Up Monday. Sounds yummmy and best of all, EASY! I'm a new follower from Mom Blog Monday! Hello! I am your newest follower from a Monday Blog Hop. I would love it if you would follow back at one or all three my blogs!